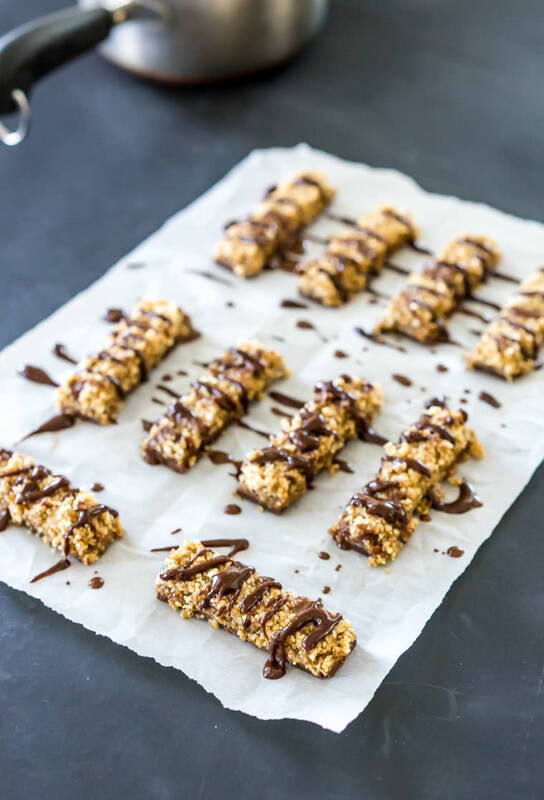 These amazing copycat Twix bars have that perfect blend of crunch + caramel + chocolate and they’re made from entirely unprocessed ingredients (almost completely coconut, dates, and nuts). This article is by Andrew Olson, founder of One Ingredient Chef. First, line a 9×9-inch baking dish with parchment paper and set aside. To make the chocolate layer, combine 1/4 cup coconut butter with 2-3 tablespoons of cocoa powder, 2-3 tablespoons maple syrup, and 1 teaspoon of vanilla in a saucepan and warm until all the ingredients are melted and incorporated. It will likely become very thick and you'll want to add water (2-3 teaspoons at a time) until it's the consistency of a thin icing. When it's ready, spoon this onto the parchment-lined dish as evenly as you can. Transfer to the freezer to firm while you make the other two layers. To make the caramel layer, combine 2/3 cup dates, 1/3 cup almond butter, 1/3 cup coconut milk, a pinch or two of salt, and 2 teaspoons of vanilla in a blender and simply blend until smooth. It's amazing how much this tastes like caramel! Set aside for now. To make the cookie/shortbread crust layer, combine the cup of mixed nuts, 2/3 cup dates, and salt in a food processor. Process until the nuts are broken down and the mixture is sticky. Then, add in the puffed rice and just pulse several times until it's broken into smaller pieces and incorporated. Remove the chocolate layer from the freezer. It should be at least semi-firm at this point, which will make it much easier to spread the caramel layer on top, which happens next. Once you have the chocolate covered by the caramel, pour on the crumbly crust and press it evenly into the caramel with a bit of pressure until it sticks. Cover and refrigerate/freeze for at least 90 minutes in order for everything to firm up. Finally, remove from the fridge and cut into bars 2/3 inch wide and about 4.5 inches long. At this point, you have a choice… you can serve as is, with the crust on top – they're great that way. 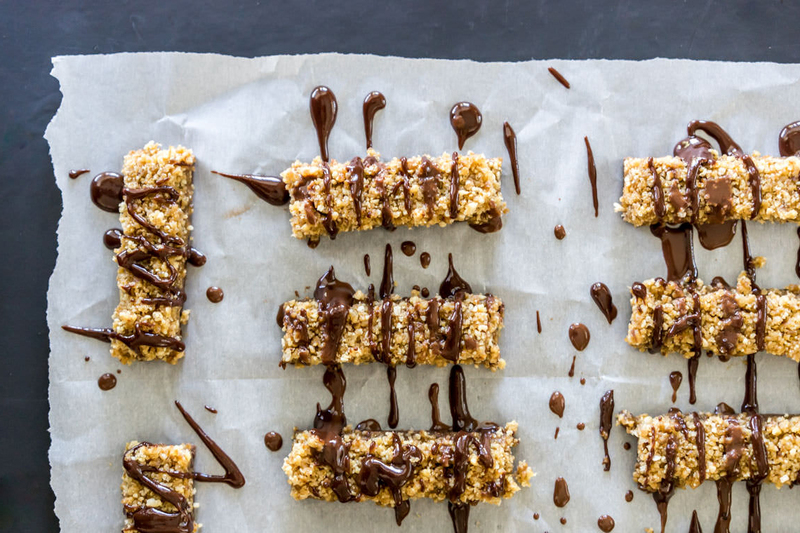 Or you can make another smaller batch of the chocolate sauce from step one and drizzle on top (as shown) to make them look more authentic and also to help the more crumbly crust layer stick together. Either way, keep refrigerated until ready to serve for the best texture. Read this next: How To Become A Vegetarian When You Love Meat.